Cardiovascular research focuses on physiology of the heart and cardiovascular system. From basic biological investigation through to disease focused research, and translational research with a bench to bedside focus, cardiovascular research in animals is a diverse and multidisciplinary applcation. Whether your research is basic or translational, or somewhere in between, ADInstruments offers a range of solutions for accurate and sensitive cardiovascular measurements. And with the ability to integrate data streams from blood flow, NIBP, isolated heart, arterial pressure, ventricular pressure and volume, laser doppler flow, electrophysiology and more, our systems can evolve as your experiments do - ensuring quality results wherever your research takes you. Cardiovascular Electrophysiology allows for the precise measurement and analysis of ECG waveforms, heart rate variability, arrhythmias, waveform morphology, and cardiac action potentials. Whether measuring surface or intracardiac ECG, and whether stimulating, pacing, or just recording, LabChart’s tailored tools and modules enable easy and powerful data analysis. Hemodynamics is the investigation into the dynamics of blood pressure the forces required for the heart to pump and circulate blood flow throughout the cardiovascular system. As a vast majority of all cardiovascular disease and disorder relate to hemodynamic functions, this is an important and highly studied area of cardiovascular research. 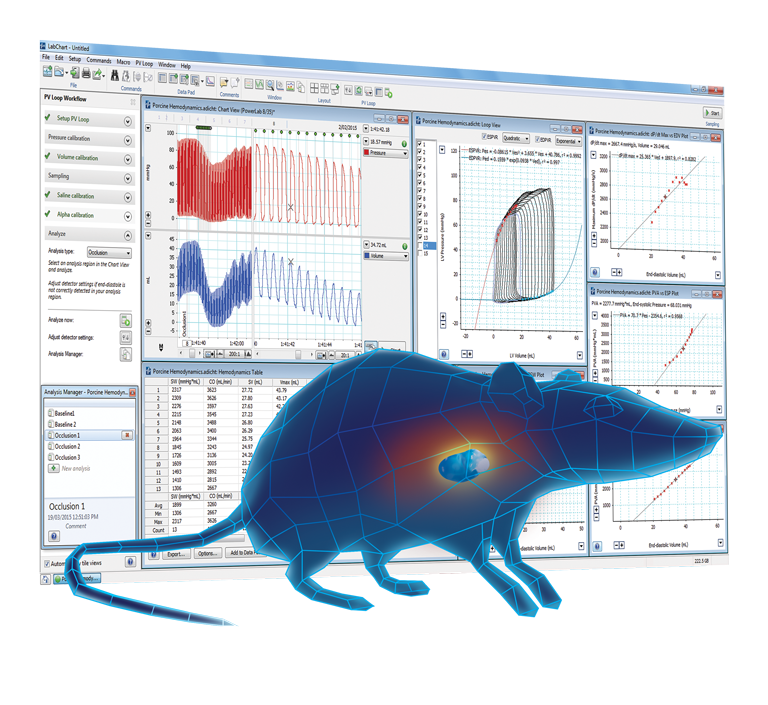 Whether you want to monitor mechanical and electrical cardiac parameters without the influence of other physiological processes, examine the influence of preload and afterload on cardiac work or record atrial and aortic pressures, our isolated heart systems can support your research with simple set up, flexible recording and powerful analysis. to questions related to Cardiovascular in our Support Articles. in Cardiovascular on Google Scholar cite ADInstruments. Thank you for your interest in Cardiovascular. Please complete and submit the form below and an ADInstruments representative will aim to get in touch within one working day. If you’d like to speak to someone immediately, office contact information is available from the contact page.